Pic exclusive: A Man In A Room Thinking, 1947, by Jack B Yeats. Image: Image courtesy The Model, Sligo. TWO PAINTINGS BY Jack B Yeats which have never previously been seen by the public will be on display on Sligo at the start of next month. TheJournal.ie has an exclusive picture of ‘A Man in a Room Thinking’ in our slideshow at the end of this article. There is also an image of ‘A Horseman Enters a Town at Night’ - considered to be one of Yeats’s masterpieces. The two paintings came from the estate of writer Graham Greene and were sold at auction by Christie’s of London last month to a private collector for a combined total of almost €500,000. The Model arts centre in Sligo town, home of the Niland Collection, will show the two paintings as part of a Yeats exhibition, the first major one in over 30 years. This previously unseen oeuvre is considered to be one of Yeats’s masterpieces. The exhibition at the Model opens on February 6 and continues until June 5. It is guest curated by artist and critic Brian O’Doherty, who was friends with Jack B Yeats from his days as a medical student right up until Yeats’s death in 1957. A conversation between O’Doherty and former Yeats Curator at The National Gallery of Ireland Dr Hilary Pyle will take place at the exhibition opening. Contact The Model here for more details. Pic exclusive: Man in A Room Thinking, 1947, by Jack B Yeats. Image courtesy The Model, Sligo. 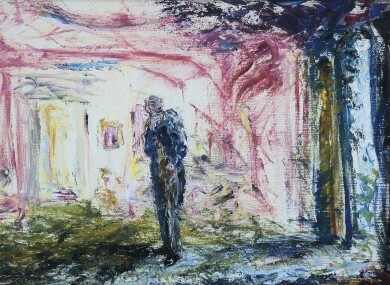 Man in A Room Thinking by Jack B Yeats has never been seen in public before. It goes on display at The Model, Sligo next month. Masterpiece: A Horseman Enters A Town At Night, 1948. Image courtesy The Model, Sligo. A Horseman Enters A Town At Night by Jack B Yeats goes on public display for the first time next month at The Model, Sligo. It is regarded as one of Yeats's masterpieces. Communicating With Prisioners, 1924, by Jack B Yeats will go on show at The Model, home of the Niland Collection from which it is taken. The Funeral of Harry Boland, 1922. Image courtesy of the Niland Collection at The Model, Sligo. The Funeral of Harry Boland, 1922, by Jack B Yeats will go on show at The Model, home of the Niland Collection from which it is taken. They Love Me, 1950. Image courtesy of Karen Reihill Fine Art. This Yeats work, They Love Me (1950), is owned by a private collector. It appears courtesy of Karen Reihill Fine Art at The Model, Sligo. The Two Travellers, 1942. Image courtesy of the Tate, London. The Two Travellers by Jack B Yeats, painted 1942, appears on loan from the Tate Gallery, London, at The Model, Sligo. Email “Pic exclusive: Two previously unseen Jack B Yeats works to go on show”. Feedback on “Pic exclusive: Two previously unseen Jack B Yeats works to go on show”.